"The Yamaha P155 will keep musicians and songwriters inspired with music for a long time to come." 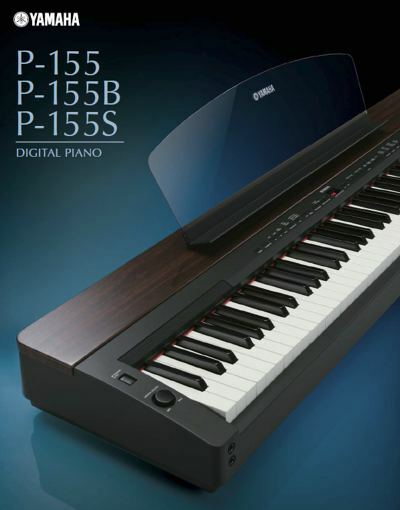 The P155 pushes the envelope in portable digital piano technology even further. How? Well, how does 4-levels of CFIIIS stereo piano samples with key-on/key-off samples and 128 notes of polyphony under the hood sound? These are the same features found in the new Clavinova CLP340 and CLP370 digital pianos. And, of course, the Yamaha P155 has the Graded Hammer Effect keyboard touch for the most realistic feel possible. All of these great features come in a package that weigh in at a mere 37lbs. (18.6kg)—that's 115lbs. (52.2kg) lighter than the CLP340. The P155 comes in a choice of three color trims—P155: black with mahogany top-board, P155B: black with ebony top-board, and P155S: silver with cherry top-board. The P155 comes with 17 different preset voices that range from pianos, organs, and strings to a warm nylon guitar, spacious choir, and electric bass. However, let's discuss what we are all really interested in—the piano samples. The P155's piano samples were recorded from Yamaha's flagship CFIIIS 9' concert grand piano at 4 different velocity levels. These velocity levels do a good job of recreating the tonal characteristics of the CFIIIS and they blend smoothly from one velocity sample to the next. Yamaha also took the extra step to include subtle key-off and key-on samples. When you release a key (key-off), the sound of damper felts contacting the vibrating string will be heard. Whenever you are playing (key-on) and have the damper pedal pressed, sympathetic string resonance effects can be heard. These effects combined with these gorgeous piano samples are truly amazing to hear. I really liked how expressive the piano was—I was able to play quick passages and still have total control over my expression from pianissimo to forte. The Yamaha P155's piano preset is suited for all styles of music from classical, new age, to adult contemporary, R&B and pop. If you've ever tinkered around with the Clavinova CLP 300 series pianos then you'll recognize that the P155 has the same two-track sequencer. Although Yamaha calls these two tracks: LEFT and RIGHT on the panel buttons, you could consider them being tracks 1 and 2 since you can change individual track data such as voices, effects depth, and so on. Just like the Clavinova CLP300 series, you can record up to three songs on the P155. If you want to have more than three songs, you'll have to use the P155'S USB port and save your existing songs to your device before continuing to record new ones. Recording sequences on the Yamaha P155 was straight forward and intuitive. Choose your voice, effects, etc, press the REC button and recording will begin automatically as soon as you play a note. Pressing the REC button again will end the recording. The P155 also comes with other cool features such as dual and split voice modes. Dual voice mode allows you to layer any two voices together, adjust their volumes, effects depth, and octaves. Split voice mode allows you to set the split point anywhere on the keyboard and assign a voice on each side of the split. Dual voice mode is great for creating new and interesting sounds where split voice mode is great for playing a different voice on each hand such as bass on the left and piano on the right. Lastly, the P155 comes with several different reverbs and brilliance settings allowing you to control the brightness and ambience of your sounds, a touch sensitivity function, transpose and tuning functions, metronome, FC4 footswitch, power adapter, and two built in 12W speakers to get you playing your piano quickly out of the box. The P155 breaks the 128 note polyphony and the 4 multi piano samples barrier—a first in Yamaha's Contemporary and Portable Digital piano line up. Its features, not too long ago, were only reserved to the Clavinovas and to some degree the CP stage piano series. So, I'm quite glad that Yamaha decided to engineer a high quality digital piano that could be used for gigging and studio recording. Currently at a price tag of $1,299 it's Yamaha's priciest P series piano; however, keep in mind the P140, the next model down, goes for around $1,000 and doesn't come with all the new advanced features that the P155 comes with. Overall the Yamaha P155 is a great value for what it has to offer—its amazing 4-level velocity grand with key-on/key-off samples, the precise GH keyboard and two track sequencer will keep musicians and songwriters inspired with music for a long time to come.